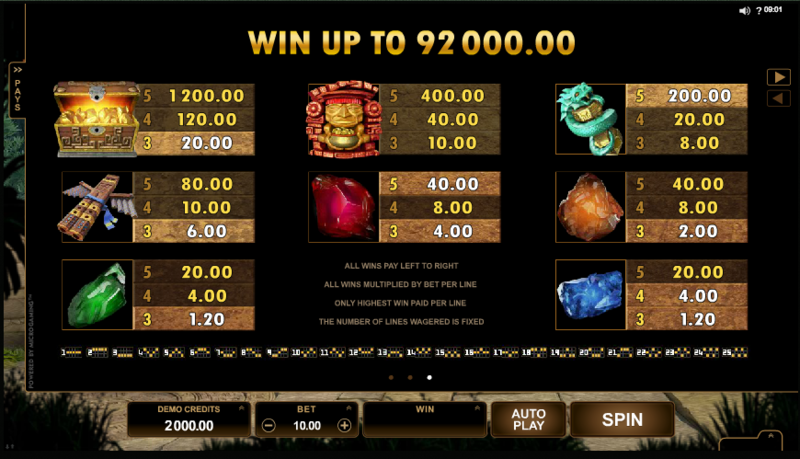 We’ve played a number of online slots with a narrative which features a quest for gold in the jungles of South America but it’s always good to see a new one added to the genre. This one involves an adventure called Jungle Jim, it’s all about his grave-robbing trip to the mythical El Dorado and it’s developed by Microgaming. Jungle Jim El Dorado is a five reel slot with twenty five paylines; it looks great and those transparent reels spin against a backdrop of a steamy jungle setting. Jungle Jim stands in the ruins on the left hand side, occasionally having a drink or leaning on his spade. The symbols are a range of theme-related objects and include a treasure chest, a totem pole, an Aztec mask and a blue serpent; four coloured gems – red, orange, green and blue – make up the lower values. The Jungle Jim logo is wild and will replace all others in a winning combo except the scatter – that’s a complex circular object and it activates the main feature. 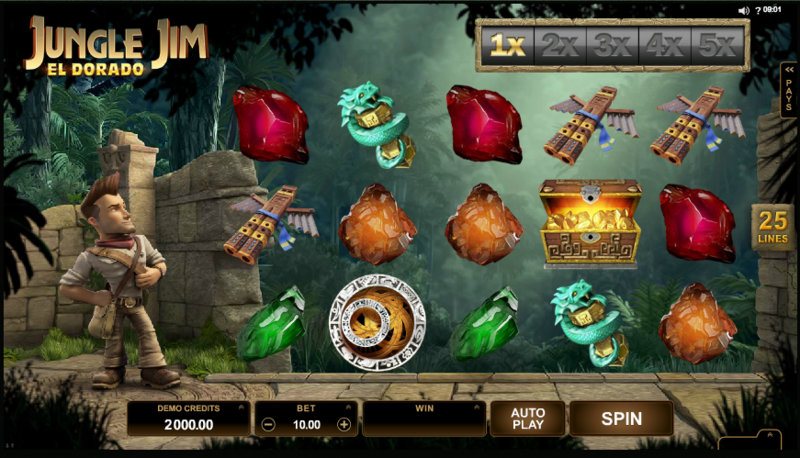 Jungle Jim comes with the good old Rolling Reels feature which is active in the base game and free spins; whenever you land a winning combo those symbols involved will disappear to be replaced by others falling in from above – more combos may then be formed and the process continues in this manner. Consecutive wins increases the multiplier up to a maximum of 5x. This is triggered by landing three of the circular scatter symbols anywhere in view; you will now receive ten free spins which can be retriggered in the same manner. During this round the Rolling Reels multiplier increases to 3x, 6x, 9x, 12x and 15x for some bigger wins, as you can see from the video above. Some of Microgaming’s recent releases have been rather uninspired but Jungle Jim El Dorado is much better – it’s graphically superb and the Rolling Reels feature is always one of our favourites. It also comes with a nice high RTP of 97.00%. If you’re looking for something similar, try also Net Ent’s Gonzo’s Quest.